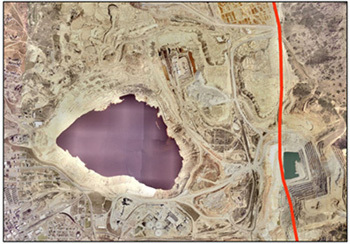 The Berkeley Pit is literally world famous in the mine waste cleanup industry, and the final technology used in the Horseshoe Bend Water Treatment Plant, a High Density Solids (HDS) process, was selected after an assessment of tests and the demonstrated effectiveness of cleanup technologies from research groups around the world. A clarifier, drained for maintenance, at the Horseshoe Bend Water Treatment Plant. The plant will eventually be required to treat water from the Berkeley Pit. The Horseshoe Bend facility currently treats water from Horseshoe Bend, and will eventually be used to treat water from the Berkeley. 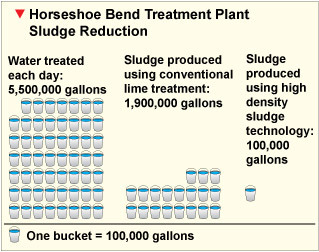 The treatment plant utilizes a two-stage lime (calcium hydroxide) precipitation process in combination with HDS technology. Lime, aeration and polymer addition remove metals from the water. The fully automated facility generates about 10 times less sludge than a conventional lime treatment plant. 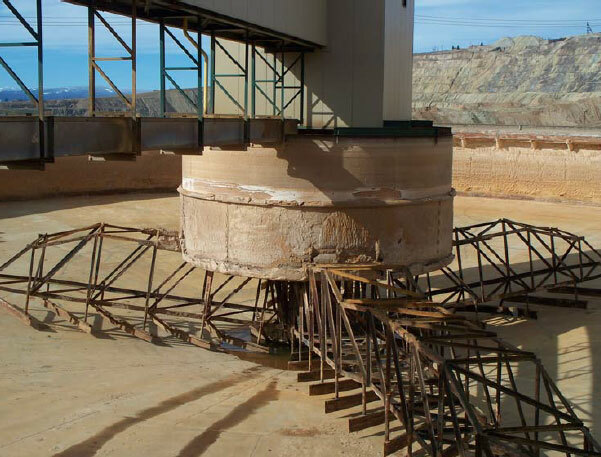 HDS technology produces denser sludge through a recycling process in which the sludge generated in the water treatment process is sent through the system many times. The process resembles a snowball effect. Each time sludge particles are sent through, they grow in size as new particles attach to the old ones. At the end, the final sludge product – like a watery mud – is much denser. The relatively low final volume of sludge – currently about 40,000 gallons per day in a 220,000-gallon slurry – is deposited in the Berkeley Pit, eliminating the need for a land-based sludge repository. Test results indicate that sludge disposal in the Pit may raise the pH of the water over a 10- to 20-year period, which could potentially decrease treatment costs for Pit water. Due to the design of the system, treated water can easily be used in the concentration process at the adjacent Montana Resources mine, or, in the event that the mine ceases operations, discharged to Silver Bow Creek upstream from the confluence with Blacktail Creek near Montana Street. The volume of treated water should add about 4.5 cubic feet per second (cfs) of flow to the creek, which represents about a 50 percent increase to the base flow of 10 cfs. A performance test of the Horseshoe Bend plant was completed in November 2007, as mandated by the Record of Decision. Based on the performance review, water discharged from the plant meets all discharge standards for contaminants of concern set by the EPA. Additional adjustments still need to be made to address pH. In general, plant operations are going as expected.